Make a splash into the market with these forex tips. Currency pair Australian and US dollar was able to smoothly get out of the downtrend and start to grow. Such movements on the currency chart can rarely be seen. Smooth and confident change of direction of price movement, as a rule, show traders and investors a major change in the currency market trends. 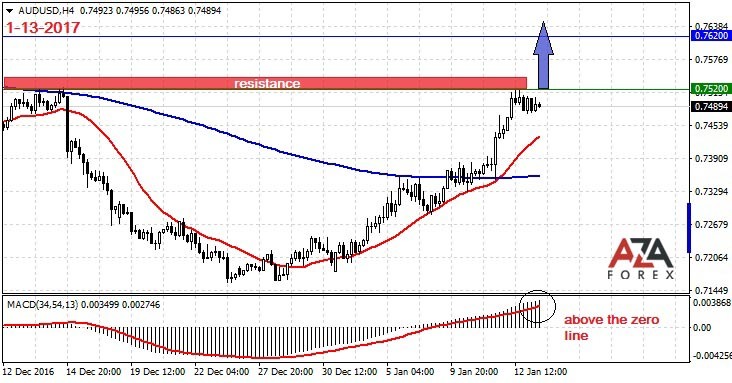 Now the price went up and stopped near the resistance level, located in the area of ​​0.7500. Earlier, the price tested this level on different sides. History repeats again, the price again is in this level. If investors continue to buy the currency tool, this level will be passed easily. Price is already growing for several days, and after usually occurs a correction as traders and other participants in the foreign exchange and fixed income tori partially close their positions, but we have not seen this yet. Therefore, it is necessary to be prepared for the fact that the correction can begin right now. Patient trader - is a successful trader. We will wait for a new round of rates growth, for the successful and profitable trade in the Forex market.